Attwood, Jayarava. (2017). ‘Epithets of the Mantra’ in the Heart Sutra.' Journal of the Oxford Centre for Buddhist Studies, 12, 26–57. http://jocbs.org/index.php/jocbs/article/view/155. Attwood, Jayarava. (2017). 'Form is (Not) Emptiness: The Enigma at the Heart of the Heart Sutra.' Journal of the Oxford Centre for Buddhist Studies, 13, 52–80. http://www.jocbs.org/index.php/jocbs/article/view/164. Far from systematic, this collection of essays are my notes from several years of studying this text and its antecedents in the light of Jan Nattier's landmark, 1992 article (see the first essay on the list). 1. The Heart Sūtra - Indian or Chinese? (17 Sep 2007) Precis of Jan Nattier's 1992 article on the provenance of the Heart Sutra. 2. Words in mantras that end in -e (6 Mar 2009) The Grammatical function of the -e case marker in mantras, suggesting that this is from Prakrit and indicates a masculine nominative singular. 3. Tadyathā in the Heart Sūtra. (13 Nov 2009) Grammar and syntax of tadyathā in relationship to mantras. Not originally intended to be included in recitation. 4. Some Additional Notes: The -e ending in mantras. (30 Jul 2010) Further note on the -e ending which shows that it was in widespread us as nominative singular in Northern India [Signe Cohen]. 5. Heart Sutra Syntax . (23 Nov 2012) Initial notes on a grammatical error discovered in Conze's critical edition of the Sanskrit Heart Sutra, with proposed changes to the text. Now submitted to an academic journal. 6. Heart Sutra: Horiuzi Palm-leaf mss. Transcription (5 Dec 2012) An important Sanskrit manuscript of the Heart Sutra. 7. Emptiness for Beginners. (14 Feb 2013) Brief explanation of the concept of emptiness based on close study of Nāgārjuna's Mūlamadhyamkakārikā. 8. Heart Sutra Mantra. (30 Aug 2013) Detailed notes on the source texts for the mantra found in the Heart Sutra. Definition of mantra vs dhāraṇī with suggestion that the "mantra" is in fact a dhāraṇī. 9. Heart Sutra Mantra Epithets. (6 Sep 2013) Notes on the epithets often associated with the mantra. Shows that "mantra" is probably the wrong Sanskrit word, and that the source texts, particularly Pañcaviṃśatisāhasrikā Prajñāpāramitā Sūtra has "vidyā". Epithets are in fact unrelated to the dhāraṇī and refer to prajñāpāramitā more generally. 10. Who Translated the Heart Sutra into Sanskrit? (13 Sep 2013). Using idiosyncrasies in the language to place limits on who could have translated it from Chinese to Sanskrit. 11. Fixing Problems in the Sanskrit Heart Sūtra. (20 Sep 2013). Given the problems created by translating from Chinese into Sanskrit, how would we improve on the present sutra. 12. A New Sanskrit Heart Sutra. (27 Sep 2013). A revision of the edition of the Heart Sutra by Edward Conze, with some back story, notes and a new translation. 13. An Alternate Sanskrit Heart Sutra. (11 Oct 2013). A speculative text based on extracts of the Gilgit manuscript of the Pañcaviṃśatisāhasrikā Prajñāpāramitā Sūtra. 14. Why is there a Dhāraṇī in the Heart Sūtra? (18 Oct 2013) Looking at dhāraṇī, attitudes of scholars and the role of magic in Buddhism through the lens of Ariel Glucklich's work. 15. Variations in the Heart Sutra in Chinese. (25 Oct 2013) Examining a critique of Jan Nattier's Chinese origins thesis on the basis of variant readings in the Chinese Tripiṭaka. 17. Roots of the Heart Sutra. (15 Aug 2014). A possible source text for the epithets passage in the Hṛdaya in the form of a verse from the Ratnaguṇasaṃcayagāthā. 18. New Heart Sutra Manuscript. (26 Dec 2014). Diplomatic edition of EAP676/2/5: Ārya Pañcaviṁśatikā Prajñāpāramitā Mantranāma Dhāraṇī (aka the long text Heart Sutra). 19. Chinese Heart Sutra: Dates and Attributions. (3 April 2015). 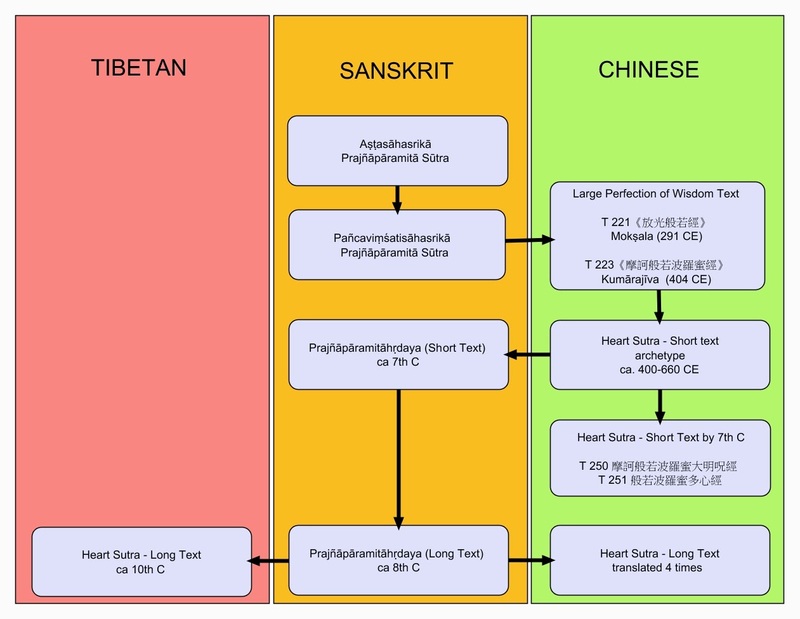 A critical review of Jan Nattier's arguments about the chronology of the Heart Sutra, in the light of a 2003 article by Dan Lusthaus presenting evidence which he argues poses a serious challenge to Nattier's theory. 20. Avalokiteśvara & the Heart Sutra. (24 Apr 2015) Forensic examination of the name in Sanskrit, Chinese and Tibetan, along with some notes about the role of the bodhisatva in the Prajñāpāramitāhṛdaya. 21. The Heart Sutra in Middle Chinese. (15 May 2015). 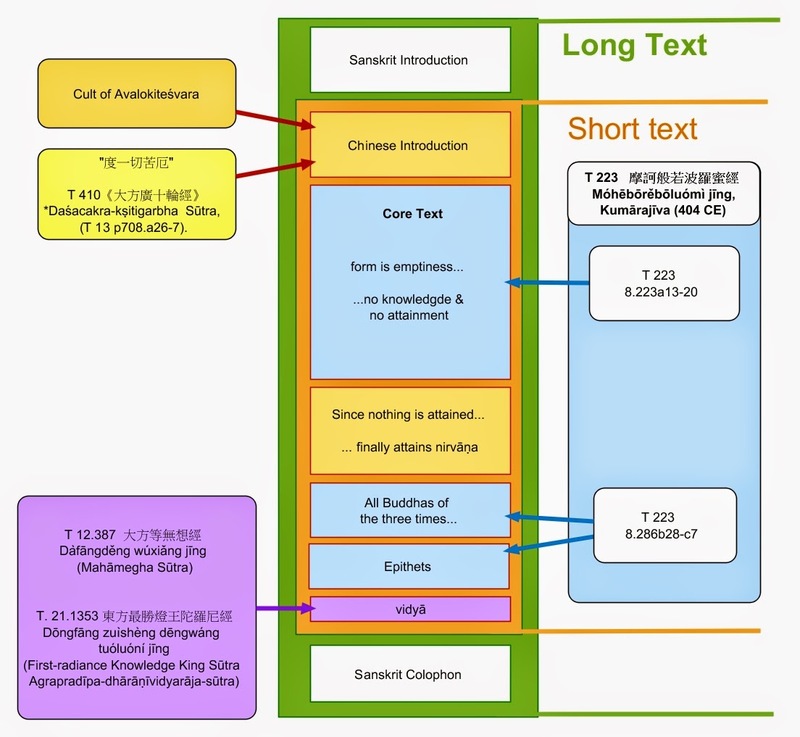 A transcription of the Xīnjīng or the Heart Sutra according to the Baxter & Sagart reconstruction of Middle Chinese. This is the Heart Sutra as it might have sounded at the time it was composed. 22a. Form is Emptiness. Part I: Establishing the Text. (17 Jul 2015) First part of this essay works through the process of establishing the text to be commented on. The method involves examining the manuscript/epigraphical tradition of Sanskrit and the canonical Chinese texts as well as versions of the Pañcaviṃśatisāhasrikā-prajñāpāramitā-sūtra in both languages. 22b. Form is Emptiness. Part II: Commentary. (24 Jul 2015) In the second part of this essay we briefly consider the traditional commentaries, then move on to treating the Aṣṭasāhasrikā-prajñāpāramitā-sūtra as a commentary on the famous passage from the Heart Sutra, providing an authoritative alternative to the common Zen inspired readings of the text. 22c. Form is Emptiness. Part III: Commentary continued. (31 Jul 2015). In the third and final part of this essay we discover that the phrase rūpam śūnyatā śūnytaiva rūpaṃ has in fact been altered. In the Aṣṭa it is rūpameva māyā māyaiva rūpam. We explore the implications of this, and sum up the whole project. 23. Taishō 256: The Other Chinese Heart Sutra. (25 Dec 2015). A first look at the other short text Heart Sutra in the Chinese Tripiṭaka and the associated manuscript in the British Library. Previously attributed to Xuanzang, this essay shows why it is not associated with Amoghavajra. 24. The Oldest Dated Heart Sutra. (1 Jan 2015). The story of the stele commonly known as 集王聖教序并記 or Preface and Notes to the Preface to the Holy Teaching with the Collected Wang's Calligraphy. Erected in 672, composed using examples of the calligraphy of 王羲之 Wang Xizhi, it is the oldest dated version of the Heart Sutra. 25. Thich Nhat Hanh's Changes to The Heart Sutra. (04 March 2016). Critiquing TNH's response to discovering the inherent contradiction in the two phrases śūnyatā rūpam and śūnyatāyām na rūpam. He changes his translation to obscure this contradiction. 26. Further Problems with the Heart Sutra: aprāpti. (07 April 2017). Summarising and critically assess the article Apocryphal Treatment for Conze’s Heart Problems by Huifeng (2014). Translating 無智亦無得 以無所得故. 27. Further Problems with the Heart Sutra: acittāvaraṇa. (14 Apr 2017). Summarising and critically assess the article Apocryphal Treatment for Conze’s Heart Problems by Huifeng (2014). Translating the phrases 心無罣礙 and 無罣礙故. 28. Heart Sutra Anomaly. (20 Apr 2017). The problem of the phrase 是諸法空相 = sarvadharmāḥ śūnyatālakṣanā. 29. The Heart Sutra and the Crisis in Buddhist Philology. (30 June 2017) Blog no.500. 30. Fixing the Broken Heart Sutra. (11 August 2017). I show that Conze bungled the editing of the Section VI. of the Heart Sutra (Section VII in my nomenclature) and how to fix the received text. 31. Red Pine's "Vagaries of Sanskrit grammar". (13 October 2017). Pines struggle with the Sanskrit of Conze's Section VI text reveals that he tacitly translates the Chinese instead, but also highlights differences in the two versions at this point, which suggest the original translator misread the Chinese. 32. The Horror of Apocrypha. (20 October 2017). How Kaz Tanahashi avoids the reality that the Heart Sutra was composed in China, by inventing a pious fiction involving divine revelation in India. 33. Japanese Reception of the Chinese Origins Thesis. (24 November 2017). 34. Types of Errors in the Heart Sutra. (12 January 2018). A structuralist review of errors by type: scribal, editorial, mistranslation, etc. 35. The Chinese Origins of the Heart Sutra Revisited (19 January 2018). A review of the Chinese features found in the Heart Sutra. 36. Anupalambhayogena: An Underappreciated Mahāyāna Term (11 May 2018) Matt Orsborn (aka Huifeng) noted that the Chinese phrase—以無所得故—does not correspond to aprāptitvād but to Sanskrit anupalambhayogena. I show how this fits with Chapter 10 of the Pañcaviṃśātisāhasrikā-prajñāpāramitā-sūtra. 37. Review of Ji Yun's 'Is the Heart Sutra an Apocryphal Text? A Re-examination'. (01 June 2018). Very long (11k words) critical review. 38. The Earliest Dated Heart Sutra Revisited. (22 June 2018). Examination of the Fangshan Stele dated 661 CE (note before Xuanzang died). 40. Sutras in Stone for the End of the Dharma. (06 July 2018). Background on Jìngwǎn (靜琬) and the Fángshān (房山) collection of stone sūtras containing the oldest dated Heart Sutra. 41. The True History of the Heart Sutra. Nonsense and Nonsensibility. (14 Mar 2014). Kātyāyana in the Aṣṭasāhasrikā Prajñāpāramitā Sūtra (26 Jun 2015). This essay tries to show that there are continuities between these two texts, linking Early Buddhist and Prajñāpāramitā thinking. All of them Arahants. Notes on Aṣṭasāhasrikā and Speech Acts. (17 Nov 2017). Notes on aspects of translating Aṣṭa. Karashima Seishi. (2011) Critical edition of Lokakṣema's translation of the Aṣṭasāhasrikā Prajñāpāramitā. Tokyo: IRIAB, Soka University. Mitra, Rajendralal. (1888) Aṣṭasāhasrikā Prajñāpāramitā. [Bibliotheca Indica 110]. Calcutta: Royal Asiatic Society of Bengal. Vaidya, P.L. Aṣṭasāhasrikā Prajñāpāramitā Sūtra. Darbhanga: The Mithila Institute, 1960. Gretil Archive, 2014. Including Karashima, S. (2013) On the "Missing" Portion in the Aṣṭasāhasrikā Prajñāpāramitā. ARIRIAB, 16: 189-192. Wogihara U. (1935) Abhisamayālaṃkār'alokā Prajnāpāramitāvyākhyā (commentary on Aṣțasahasrika-Prajbāpāramitā) by Haribhadra, together with the text commented on. Tokyo: The Toyo bunko. Dutt, N. (1934). Pañcaviṃśatisāhasrikā Prajñāpāramitā Sūtra: edited with critical notes and introduction. London, Luzac & Co, 1934. Kimura, Takayasu. (2009). Pañcaviṃśatisāhasrikā Prajñāpāramitā. Zacchetti, Stefano. (2005) In Praise of the Light: A Critical Synoptic Edition with an Annotated Translation of Chapters 1-3 of Dharmarakṣa's Guang zan jing, Being the Earliest Chinese Translation of the Larger Prajñāpāramitā. (Bibliotheca Philologica et Philosophica Buddhica, 8). IRIAB. Sanskrit text also available from Gretil. The Prajñāpāramitā, especially the extracts found in the Hṛdaya, is partly a response to developments in mainstream Buddhism especially by the Ābhidharmikas of the the Sarvāstivāda sect. The Sarvāstivādins were the dominant sect of Buddhism in North Indian for a considerable period, before Mahāyāna Buddhism displaced them. Even those who reject their ideas, are forced to do so at length. The following essays are aimed specifically at providing background reading for those interested in Prajñāpāramitā. Sarvāstivāda and the Chinese Sarva Sūtra. (25 April 2014) A preliminary to the following essays which examines the Sarvāstivāda metaphysics through the Chinese version of the seminal Sarva Sūtra. Sarvāstivāda Approach to the Problem of Action at a Temporal Distance. (02 May 2014). Early Buddhist texts contain a fundamental contradiction between pratītyasamutpāda (which forbids effects after the conditions have ceased) and karma (which demands it). I call this the problem of Action at a Temporal Distance. See also my essay on the Theravāda approach. Where and Why Did the Sarvāstivādins Go Wrong? (09 May 2014) As well as the problem of Action at a Temporal Distance, the Abhidharma project of cataloguing and classifying dharmas had inherent flaws that led Sarvāstivāda thinkers towards substance ontologies that the Prajñāpāramitā is a reaction against. See also prajnaparamitahrdaya.wordpress.com my website for Heart Sutra primary sources - manuscripts and inscriptions in Sanskrit, Chinese, and Tibetan. Beneviste, Émile. (1940) Textes Sogdiens: édités, traduits et commentés. Shaku Hannya (1923) ‘The Prajna-Paramita-Hridaya Sutra,’ The Eastern Buddhist. 2(3&4): 163-175. Links to CBETA version of the Taishō Tripiṭaka. T256 《唐梵飜對字音般若波羅蜜多心經》 Prajñāpāramitāhṛdaya Sūtra: Tang Dynasty Sanskrit Translation with Correct Characters [Representing] Sounds. See also British Library manuscript (Or.8210/S.5648). T252 《普遍智藏般若波羅蜜多心經》 translated by 法月 Fǎyuè (Skt. *Dharmacandra?). T253 《般若波羅蜜多心經》 translated by Prajñā, ca. 788 CE. T254 《般若波羅蜜多心經》 translated by Prajñācakra, 861 CE. T255 《般若波羅蜜多心經》translated from the Tibetan by Fǎchéng 法成, 856 CE, text found at 燉煌 Dūnhuáng. T257 《佛說聖佛母般若波羅蜜多經》 translated by Dānapāla, 1005 CE. རྒྱ་གར་སྐད་དུ། བྷ་ག་བ་ཏཱི་པྲཛྙཱ་པཱ་ར་མི་ཏཱ་ཧྲྀ་ད་ཡ། (rgya gar skad du | bha ga ba ti pradznyā pā ra mi tā hri da ya) = Ārya Bhagavatī Prajñāpāramitā-hṛdaya. Long Text Heart Sutra in the Tibetan Kangyur, Derge Edition, Vol. 34: 144b.6-146a.3. Tibetan & Himalayan Library. UEYAMA Daijun (1965) 敦煌出土のチベッ ト訳般若心經 [=Tibetan Version of the Prajñapāramitāhṛdayasūtra from Dūnhuáng]. Indogaku bukkyōgaku kenkyū 13(2): 783-779 [sic]. https://www.jstage.jst.go.jp/browse/ibk1952/13/2/_contents [Article is in Japanese]. Dutt, N. (1934) Pañcaviṃśatisāhasrikā Prajñāpāramitā Sūtra: edited with critical notes and introduction. London, Luzac & Co, 1934. Please note that I've made no attempt to systematically collect translations - they don't interest me very much in comparison to the text itself and offer very little illumination of the issues that concern me. Hakeda, Yoshito (trans.) (1972). 'The Secret Key to the Heart Sutra' in Kūkai: Major Works. Columbia University Press. Nhat Hanh, Thich. (2009)The Heart of Understanding: Commentaries on the Prajnaparamita Heart Sutra. [Peter Levitt, ed.] Parallax Press. Bühler, G (1881) Palaeographical Remarks on the Horiuzi Palm-Leaf Mss. in Müller (1881) [above], p.63-95. CHOONG, Mun-keat. (1999) The Notion of Emptiness in Early Buddhism. 2nd. Ed. Motilal Banarsidass. Cohen, Signe. (2002) On the Buddhist Hybrid Sanskrit/Middle Indic Ending "-e" as a 'Magadhism'. Acta Orientalia 63: 67-9. Cox, Collett. (2004) From Category to Ontology: The Changing Role of Dharma in Sarvāstivāda Abhidharma. Journal of Indian Philosophy 32: 543-597. Huifeng, Shi [釋慧峰; aka Orsborn, M. B.] (2008) A Survey Of Prajñāpāramitā Sūtra Translations In Chinese. Online: http://prajnacara.blogspot.co.uk/2011/06/survey-of-prajnaparamita-sutra.html. Jayarava. (2011) Visible Mantra: Visualising and Writing Buddhist Mantras. Cambridge: Visible Mantra Books. McBride, Richard D, II. (2004) Is there really "Esoteric" Buddhism? Journal of the International Association of Buddhist Studies. 27(2): 329-356. Mu, Soeng Sunim. (1991) Heart Sutra: Ancient Buddhist Wisdom in the Light of Quantum Reality. Primary point Press. Mu, Seong. (2010) The Heart of the Universe: Exploring the Heart Sutra. Wisdom Publications. Sheng, Ruth. (2011). The Development of Chinese Calligraphy in Relation to Buddhism and Politics During the Early Tang Era. A dissertation presented to the Graduate School of the University of Florida in partial fulfillment of the requirements for the degree of Doctor of Philosophy, University of Florida. Stevens, John. (1995) Sacred Calligraphy of the East. (3rd ed.) Boston & London: Shambhala. Studholme, Alexander (2002). The origins of oṃ manipadme hūṃ: a study of the Kāraṇḍavyūha Sūtra. Albany: State university of New York Press. Staal, Frits. 2008. Discovering the Vedas: Origins, Mantras, Rituals, Insights. Penguin. Wong, Dorothy C. (2002). The Making of a Saint: Images of Xuanzang In East Asia. Early Medieval China 8, 43-81. Yu, Pauline et al (eds.) (2000) Ways With Words: Writing About Reading texts From Early China. University of California Press. [Chapter 4. contains discussions of the text by various scholars].